We are still crossing the notoriously rough Drake Passage on our way to Antarctica. All day, 10 metre swells and 60 knot winds toss the ship about: it’s like being inside a washing machine. It is impossible to read or focus on my laptop, so I do the only thing I am capable of: I listen. I head to the lecture/movie theatre in the bowels of the ship. This is a good place to be in rough seas as there is less movement down low. My brain is a sponge, soaking up gems of information from the onboard experts, even if my writhing stomach occasionally distracts me. Jamie, the King of Krill as I call him, talks about one of his great passions, and yes, you guessed it – krill. Krill has been described as “the engine that powers the Antarctic ecosystem” because these tiny prawn-like creatures have a central position within the Southern Ocean food web. Not only do penguins, Crabeater seals and certain fish need them to survive, but so do the giants of the seas, such as the humpback and baleen whales. I discover that a humpback needs to eat a tonne of kill per day. This is like eating the weight of a small car. Krill numbers are believed to have dropped by as much as 80% since the 1970s and this has been linked to the decline of sea ice around the Antarctic Peninsula, because they feed on the algae found under the sea-ice. Quotas have been set up by the Convention for the Conservation of Antarctic Marine Living Resources, as over-fishing of krill would put even more pressure on declining krill numbers. • It has two massive ice sheets covering it: West and East Antarctic Ice sheets. • In some places the ice is almost 5 km deep and the land is buried beneath it. • In those ice sheets, 70% of the world’s fresh water is frozen. Okay, let’s think this through. All those life-giving rivers, lakes and aquifers around the world only account for 30% of our fresh water supply. All the rest is locked in ice here. • The sea freezes at around -1.8 °C. • The Antarctic Peninsula is warming at a rate 2 to 3 times faster than the global average. The average annual temperature of this region has increased by 2.5°C in the last 50 years, which is a hell of a lot! 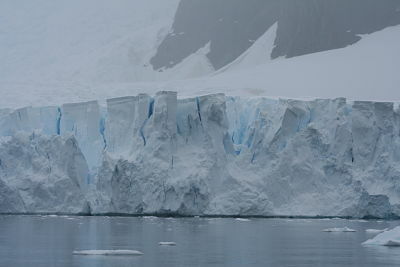 Luke cites the sudden collapse of the Larsen B ice shelf in March 2002 – within a month an area twice the size of Greater London, or the equivalent of the U.S. state of Rhode Island, disintegrated. Fascinated, I have completely forgotten my seasickness, until the lecture is over and I climb up the next level and smell dinner cooking. My stomach heaves.